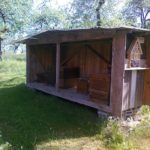 After a bit more than a year of use I’m convinced of the benefits of a bee house or shed. They provide protection for both the hives and the beekeeper, enabling inspections in otherwise borderline conditions and – at least from my experience this season – earlier colony build-up and longer brood rearing. Not everyone has the luxury of being able to synchronise colony inspections to idyllic “shirtsleeve” days, with warm sunshine and light winds, either due to work commitments or (in our case) because we need brood at particular times of the week for research. 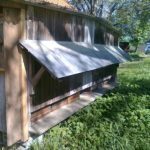 My bee shed is a simple re-purposed good quality garden shed on a solid base with some holes cut in the walls and custom-built windows. 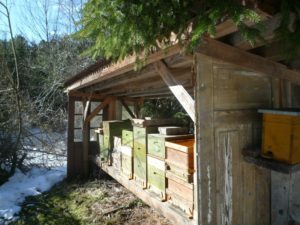 I’ve discussed the perceived and actual benefits of the bee shed previously, and described the design (and evolution) of the hive entrances and shed exits used by the bees. 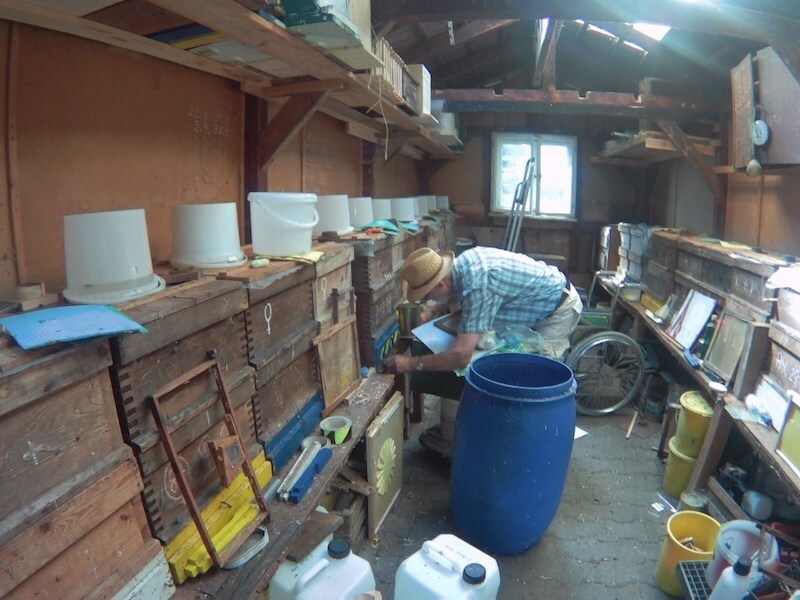 The functionality was achieved by discussion with contributors to the SBAi beekeeping forum, further informed by a tour of a ‘shed’ owned by a respected and experienced UK beekeeper, and with a bit of trial and error. Despite being broadly satisfied with my current setup I’m always interested to see how others have approached the problem of providing both shelter and access. 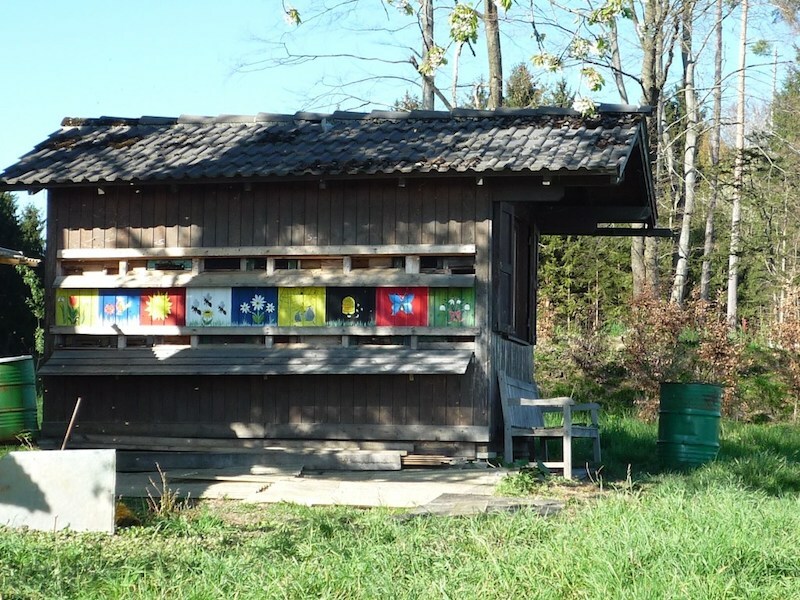 I was therefore very interested to receive a series of photographs of bee houses from Calum, a regular reader and contributor, who lives in Lindau, Germany. With Calum’s permission I’m posting these as they might also be of interest to other readers. Lindau is in Bavaria, on the northern shore of Lake Constance (Bodensee). The climate there is “mild and generally warm and temperate”, with average temperatures of 9.1°C and rainfall of about 1133mm (according to climate-data.org). 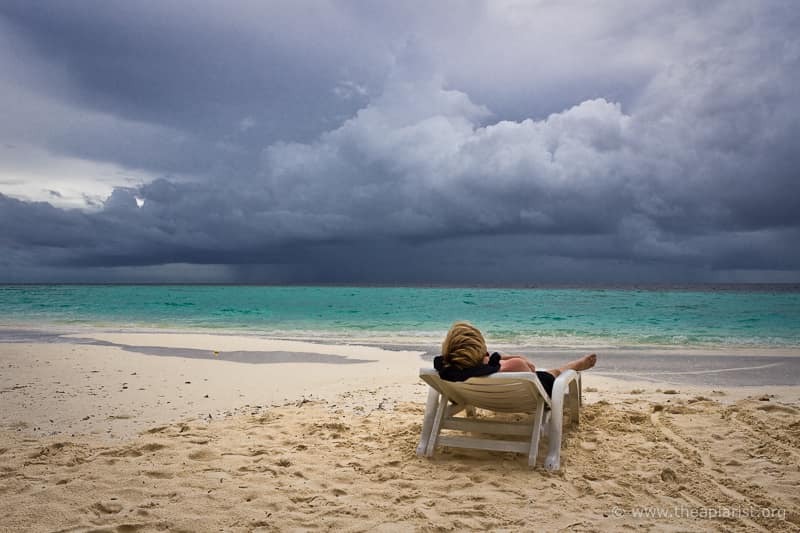 The average temperature in the warmest (July) and coldest month (January) is 18.7°C and -0.7°C†. This gives an idea of the type of conditions these bee houses were designed for. Calum tells me that there are at least 30 he’s aware of within 10km of Lindau. 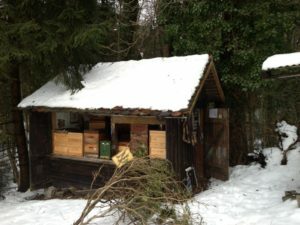 This simple shelter provides some protection for the beekeeper working the colonies together with an extended porch area to protect the hive entrances – presumably from snow and sun. 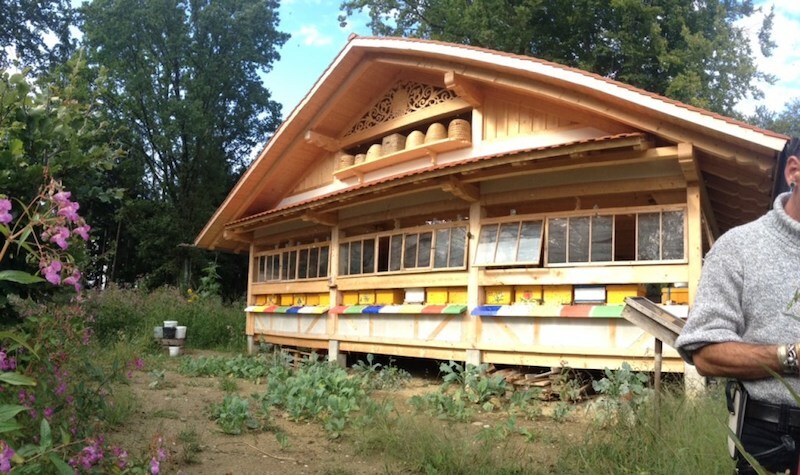 The hive entrances simply line up with a gap between the bottom of the front wall and the floor, that doubles as a landing board. I particularly like the solitary bee nestbox on one of the end walls of the shelter. 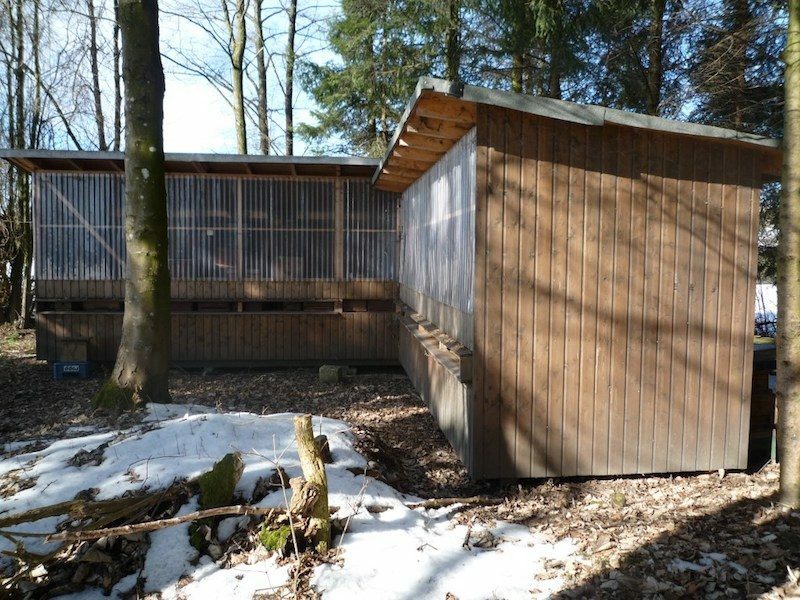 Here’s another that provides even less shelter for either the beekeeper or the hives, consisting of nothing more than a roof and end walls. 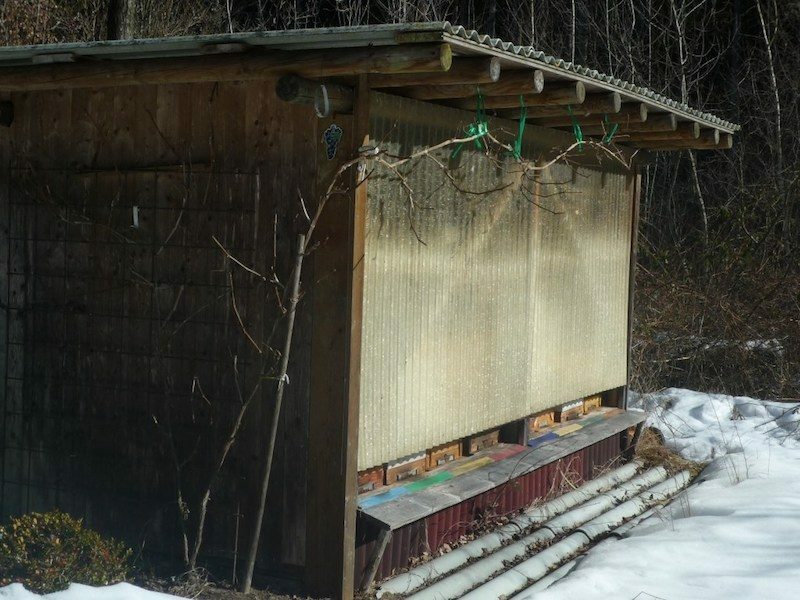 Nevertheless, the roof looks pretty sturdy to keep the snow off and the hives are oriented to catch the morning sun. Finally, here’s something a little more substantial. This is the bee house that Calum inherited when he started out, complete with the sign which I think reads “Vorsicht Stechgefahr Bienen” (Caution danger stinging bees). Clearly this was a rather robust shed originally. Apparently it was built without the front wall making adding/removing hives a simple task – no need to negotiate the door. Security can be provided by installing a couple of planks from the inside that protect the hives. 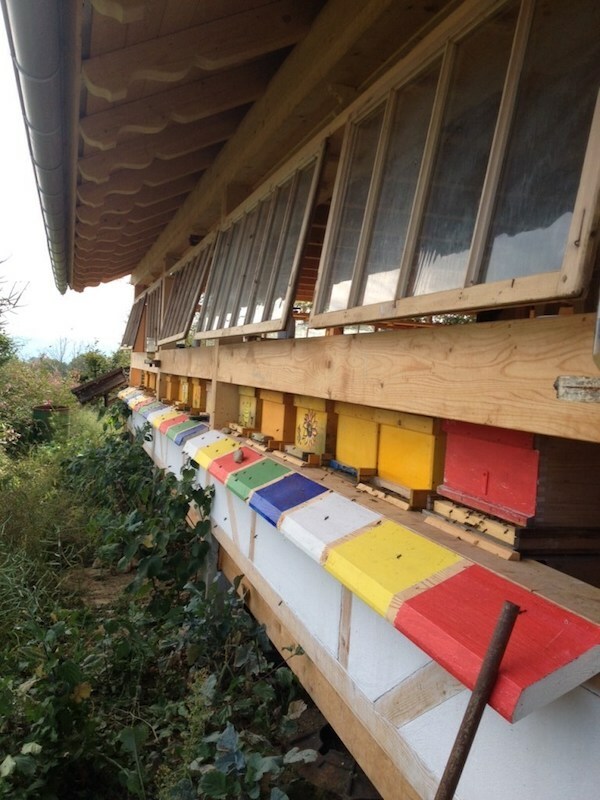 The hives are higher than on a conventional stand, making inspections of a single/double brood box comfortable, but making the removal of supers from the top of the pile a precarious occupation. † For comparison, I live in Fife which enjoys about half the rainfall of Lindau and has an annual temperature average of 8.3°C and January and July averages of 2.5°C and 14.7°C respectively. 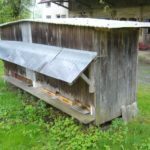 This entry was posted in Bee shed, Beekeeping and tagged bee house, bee shed, Germany on November 18, 2016 by David.